Lecturer Good morning, everybody. Now last week we were looking at the positive effects that computers have had on our society. This week I’d like to talk about one of the negatives - computer viruses. So what is a computer virus? Well, it is a software program that has been created by a human programmer with the single intention of corrupting and destroying useful programs. Put in simple terms, it’s a way of causing lots of trouble for ordinary people! It’s known as a virus because, although it’s not a biological organism, it functions in a similar way in that it looks for a host, that is, a body - your computer - in which to live and multiply, with the one aim of destroying that host. Let’s go back 50 years. In 1949 the first model of a computer virus program was presented in a paper by John von Neumann. Soon after this was published, a game known as Core Wars appeared on the scene. Core Wars was initially created for intellectual entertainment by three Americans working on large mainframe computers. By the 1980s, for the very small sum of $2.00 postage, anyone could get details on how to play Core Wars and create programs that could escape from the game and destroy other programs. 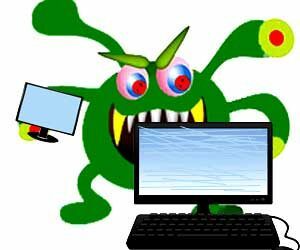 Computer viruses are picked up in much the same way as their biological counterparts - that is, through contact with others, and this can happen very easily, as literally millions of people are in touch with each other by email every day. Virus programs are often intentionally placed within useful programs such as commercial websites or they are included in software that you might have got from friends or downloaded from somewhere without knowing its real source. It seems quite hard to believe that anyone would go to all this trouble to intentionally spoil the data of other people, but the rise in the number of computer software infections, and the amount of lost data that we are seeing these days, is proof that these attackers are going to extremes to do just that ... going out of their way to create programs that hide inside legitimate software and cause all sorts of errors that their victims will then mistake for hardware failure - believing that the problem lies with their own computer. There are many types of virus, such as worms and Trojan horses, and each has its own purpose. One function of a Trojan, for instance, is to destroy and delete files on your computer. They attack by generating a lot of email and Internet traffic on your machine until it becomes completely overloaded and you can no longer use your computer. It then does the same to your friends’ machines. Bad enough, you may think. But a Trojan also allows the attacker to use the victim’s computer to purchase goods with stolen credit cards or access illegal websites. So, what can we do to combat these people? Well, the first thing is to realise that virus programmers succeed because people are not always careful about where they get their programs from. So, number one - be very careful. And 1 don’t just mean that you should be careful about the source of your software, you also need to take care with emails and avoid any messages which are suspicious-looking. So the second golden rule is ‘avoid trouble’. For instance, do not open any message that says ‘I love you’ or ‘Win $50’. A third thing we can do involves trying to find out exactly how the viruses work - in other words, we need to understand the viruses. And, of course, there is a good selection of anti-virus software available on the market now to combat the virus plague, so another way of protecting ourselves and our computers is to be well prepared. If you follow these basic rules, you really shouldn’t have any problems.